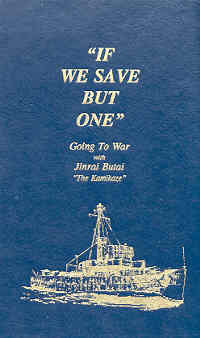 "If We Save But One"
HOME > Books > Ship Histories > "If We Save But One"
"If We Save But One": Going to War with Jinrai Butai "The Kamikaze"
The awkward title aptly summarizes this short book that contains the World War II memoirs of Dr. Raymond Malott, Lieutenant in the U.S. Navy Medical Corps, and the history of the Jinrai Butai (Divine Thunderbolt Corps) of the Japanese Navy's Kamikaze Special Attack Forces. Dr. Malott served on a ship that functioned as a floating battalion aid station with a 75-berth sickbay, an operating room, and an X-ray room. The title comes from the quote, "If you save but one man, your mission will have been successful," which someone in the family of the ship's commander said to him when first given command of the ship. 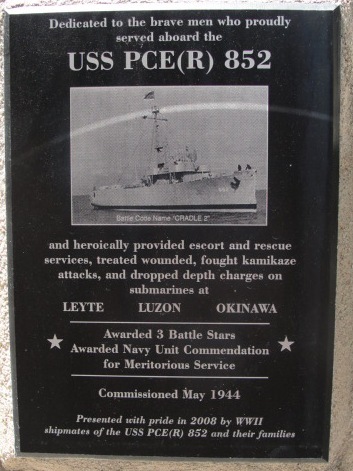 Dr. Malott had a unique perspective of Japan's kamikaze attacks, since his ship PCE(R) 852 picked up and treated survivors from several ships that suffered hits by suicide planes in the Philippines or near Okinawa. There seemed to be wounded everywhere, in the mess hall and an adjacent berthing area. The first one I encountered was lying in a berth with a gaping wound in his right thigh from which an artery was pumping a thin stream of blood in a six foot arc. I fished a hemostat from my back pack and clamped the artery, then went on while the corpsmen dusted in sulfanilamide powder and bandaged the wound. The deck was slippery with blood, and as the destroyer rolled the blood sloshed back and forth over my shoe tops. I ruefully recalled complaining in Bermuda that I wanted to wade in blood, and now in a macabre fashion my wish was being granted. There were six other wounded. Two of them had legs torn off at the knees, the rest had multiple compound fractures of the legs, and of these one also had head injuries. Most were in shock from blood loss. We did rapid triage, staunched bleeders, gave IV plasma, bandaged and splinted the shattered legs. While we worked, the crew of the Talbot filled us in. A Kamikaze had dived at their starboard side. The ship's gunners had thrown a hail of fire at the plane and scored repeated hits, exploding the plane, but the plane's parts kept hurtling toward them. The plane's motor crashed through the deck house, and one of the plane's wings swept across the deck like a huge scythe, inflicting the terrible wounds we were treating. Three men who Dr. Malott had treated died during the night of irreversible shock, but he and the corpsmen saved four Talbot crewmen, including one double amputee. Dr. Malott received a Bronze Star for his heroic actions. He witnessed the carnage inflicted by kamikaze hits on American ships, but again and again he and his shipmates went to damaged ships in the midst of battle in order to rescue survivors. PCE(R) 852 treated hundreds of war casualties during battles at Leyte Gulf, Luzon, and Okinawa. 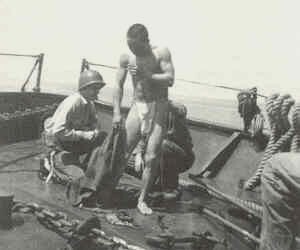 On May 4, 1945, in the midst of fighting off Japanese planes, the rescue ship took aboard 102 survivors and wounded of two ships sunk by kamikaze. When a downed Japanese airman was rescued the same day from the water, Dr. Malott showed his compassion as a doctor by treating the man's wounds despite cries to kill him from several crewmen . An individual act of mercy during a time of mutual hatred and racism sometimes does more than anything else to pave the way for peace. The last third of the book gives the history of Japan's 721st Naval Air Corps, also known as the Jinrai Butai (Divine Thunderbolt Corps in English). Dr. Malott's son one day in 1999 visited a famous Zen Buddhist temple in Japan's ancient capital of Kamakura, where he saw the Ohka Monument dedicated to pilots of the ohka (piloted glider bombs) and the crewmen of the mother plane that carried the ohka near a target to be launched. He met Toshio Torii, a former pilot of the Betty bomber that carried the ohka weapon, and Dr. Malott's son mentioned about his father's rescuing a downed airman on May 4, 1945, the same date that the Jinrai Butai lost five Betty bombers carrying ohka. Torii made an extensive but unsuccessful search to identify the downed Japanese airman, and he wrote a 45-page handwritten letter in English of the Jinrai Butai's history, which has been included in this book. The history seems accurate based on other sources, but it does not have much direct connection with the book's first part since the Jinrai Butai was just one unit in the Navy's Kamikaze Special Attack Forces. Torii's history also lacks background information, and it contains some grammatical and spelling errors since Dr. Malott transcribed it verbatim. Individuals who want a more complete history of the Jinrai Butai and the ohka weapon should read Thunder Gods by Naito or The Cherry Blossom Squadrons: Born to Die by the Hagoromo Society. Although this privately-published book had limited distribution, it provides the enlightening perspective of a medical doctor who witnessed firsthand the devastation inflicted on numerous American ships and crewmen by kamikaze planes.